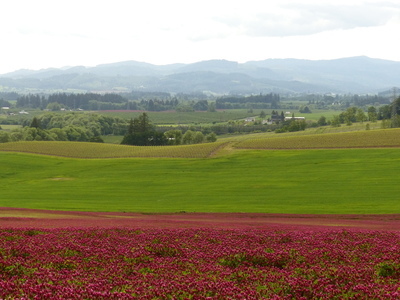 Crimson clover blooms in the foreground, with vines visible in the distance in Carlton, Oregon. This image was taken during an oral history interview with Mike and Drenda Bayliss on May 5, 2016. The Baylisses were interviewed by Linfield College archivist Rachael Cristine Woody. Linfield College Archives, "Mike and Drenda Bayliss Interview 13" (2016). Browse All Willamette Valley Oral History Interview Photos. Image. Submission 192.